Eat, Shrink & Be Merry! Great-Tasting Food That Won’t Go from Your Lips to Your Hips! is a cookbook that is also a guide to healthy eating and living. It was created by Janet and Greta Podleski, two sisters that have their own cooking show on The Food Network Canada. The goal of Eat, Shrink and Be Merry is to help people cook delicious, healthy meals while at the same time attempting to address the confusion that many dieters have regarding the best way to eat in order to lose weight and stay healthy. The Podleski sisters recommend making small and gradual changes to your diet and lifestyle because this is more likely to produce successful results in the long term. They endorse a ‘back to basics’ approach and instruct dieters that calories and portion sizes really do matter when it comes to losing weight and looking after your health. The foundation of Eat, Shrink and Be Merry is its large selection of healthy recipes that includes sections on snacks, appetizers, salads, soups, poultry, seafood, meat, side dishes and dessert. All of the recipes have amusing names such as Sticky Chicky, Worth Every Penne, Kentucky Freud Chicken, These Beets Were Made for Walkin’ and The Great Pretenderloin. Fruit, vegetables, chicken, beef, bacon, turkey, salmon, whole wheat bread, pasta, wild rice, olive oil, parmesan cheese, rosemary, chocolate, hummus, peanuts, almond butter. Dieters are encouraged to do some form of exercise every day. Eat, Shrink and Be Merry includes motivational tips that will encourage you to make exercise an important part of your life. Eat, Shrink & Be Merry! Great-Tasting Food That Won’t Go from Your Lips to Your Hips! retails at $29.95. Helps to eliminate confusion about healthy eating. Recommends a gradual lifestyle-based approach to weight loss. Contains 150 healthy recipes that are simple to prepare. Does not require unusual ingredients. Will not appeal to dieters who don’t like to cook. Some recipes include processed ingredients. Does not include many vegetarian options. Written with female readers in mind. 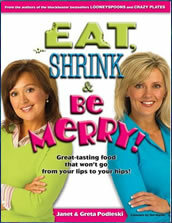 Eat, Shrink and Be Merry will appeal to dieters who enjoy cooking and want to learn more about healthy eating. The book is entertaining and humorous, while at the same time presenting tasty recipes and information about how to make better choices, so that you can lose weight and lead a healthier life.